ART OF TRANSPO: There’s a road there somewhere. The pic was taken yesterday in the ‘burbs of Buffalo, N.Y. Meanwhile, the NWS is predicting a high of 68 in L.A. today — brrrr! Photo by Tony, via Flickr creative commons. A brief article on a fascinating subject. The auditing firm KPMG predicts that families with two cars will decline in coming years, in part due to car-sharing services. The number of households in Los Angeles with two cars is 48 percent, which is lower than the national average. I suspect that number would be far higher if more of the ‘burbs surrounding L.A. were far higher. Transit isn’t mentioned in the article and probably should have been. As time goes by and there’s more of a transit network here (Metro currently has five rail projects under construction and others in the planning stages), car sharing, ride sharing and better walking and bike connections, I suspect more families in the area will try to forgo the second or third car and rely on less expensive alternatives. People aren’t going to stop driving but I do think they’ll pick and choose their spots better and that could be an enormous benefit to our region in many ways: it would help reduce air pollution, it would help traffic from getting worse and it could save precious urban space that otherwise would be used on more and more parking lots or garages. Even a car sitting in a driveway un-used is costing owners money: financing, insurance, depreciation, etc. He’s also looking for information he can pass on to the folks who deploy workers to address issues as small as unidentified crud on train seats. Sounds familiar. I’m sure most of you reading this are familiar with Metro’s main Twitter account. On most weekdays, we have a pair of folks who issue service alerts and answer questions/concerns from 5 a.m. to 9 p.m. and we also try to keep an eye on the account outside those hours so we can tweet when necessary. We also have a Twitter feed dedicated to only service alerts and another to elevator outages. In addition, many Metro projects have their own Twitter accounts; here’s the current roster. All in all, the Twitter stream provides a pretty fascinating glimpse in real-time into the Metro system and, by extension, the cities and county it serves. The New York MTA is looking at different technologies designed to stop people from falling or being pushed onto tracks in front of incoming trains. There are two main options. Sliding doors could work — the challenge is the New York Subway system has more than 400 stations and 10 different types of subway cars. Intruder technology is another option, the challenge there being that it works better when there’s time to stop or slow a train. 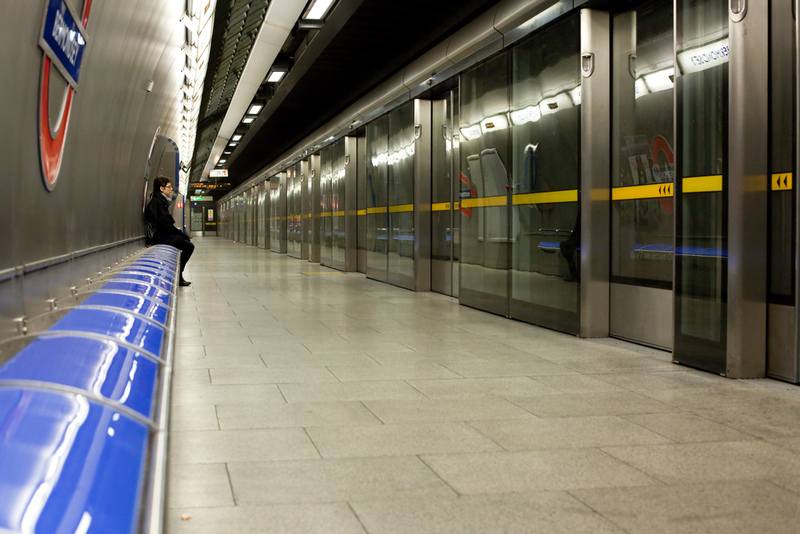 Subway platform doors in the London Tube. Photo by Lars Plougmann, via Flickr creative commons. Those are amazing words to hear from a Caltrans assistant director, especially given the department’s reputation for adamant adherence to planning practices that have focused on making driving safe and easy, to the detriment of other users. Los Angeles probably has a large number of single person households, thus single car households. Not many single persons have more than one car. I have two and a RV which is up for sale. Now that’s a real gas guzzler. I don’t know how most seniors can afford one. It was $900. one way to visit my brother in Montana. I could have probably chartered a priviate jet for that amount. There is no rapid transit where I live in West Hollywood. The 704 is not that much faster than Line 4 and still takes forever to get somewhere. It’s time they started building Light Rail where people travel instead of where it’s easiest to build. Santa Monica Bl. is a clear candidate for Light Rail. Most of the old P.E. right of way still exists or only slightly modified. And I doubt Beverly Hills aquired the right of way thru it’s city. Since the land was most likely granted via the federal government it’s grandfathered by law to be used only for rail use. It’s time for voters to demand that corridor receive Light Rail as the next project approved by the MTA ahead of those extentions to Light Rail thru the suburbs.